You ever wanted to peace out of a Masto conversation? People went off on a tangent you don&apos;t care about and they keep getting into your mentions? 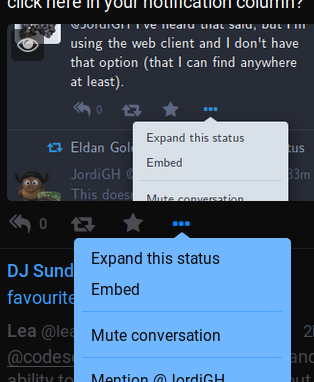 Click on the three dots next to the unwanted mentions in your notification column and then "mute conversation". The friends will keep on talking and you won&apos;t have to hear them. This only silences this thread; people in it can still talk to you outside of it. @deejoe Might differ by Masto version. I don&apos;t know about 3rd party clients. I&apos;ve seen that forever on the main web client, which is the only one I know. 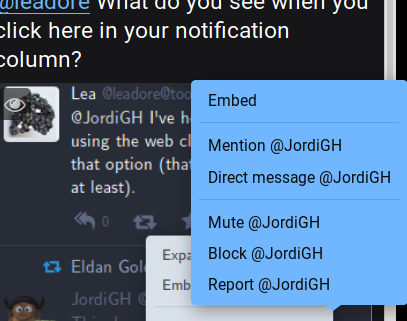 @JordiGH I've heard that said, but I'm using the web client and I don't have that option (that I can find anywhere at least). @leadore What do you see when you click here in your notification column? Thanks for mentioning again which column was involved (It didn't jump out at me in your OP that it would only be there). Now that you posted that, I see that it appears in the post's menu only when you click on it *in the Notifications column*. I had been clicking on the menu of the opened/expanded post, which is in the thread's column and does not have that option on the menu. So I would consider that to be a bug. @leadore I can sort of imagine why it&apos;s the way it is. Only notifications can be muted and a conversation isn&apos;t the same thing as a notification about it. Expanding a discussion in the third column can be done for any thread, not only those you are involved in, so "muting" threads you never have participated in is a bit funny, since muting only removes notifications (doesn&apos;t hide it from your timeline, for example). I agree this all could be better and it&apos;s obviously confusing right now. @JordiGH It could go by whether the user is mentioned in the toot.